Philadelphia region leading this movement. The Morris Arboretum Horticulture Center opened in 2010 as the hub for horticulture, public programming and facility staff. The 20,849-square-foot building in Chestnut Hill is LEED Platinum certified and received the 2012 American Architecture Award for top new projects in the country. Designed to the highest green building standards, the Horticulture Center provides the space to manage the 167-acre property, while maintaining the Arboretum’s commitment to environmental stewardship and educating visitors about the importance of natural resource protection. The Center boasts geothermal wells, a green roof, solar energy, water cisterns and more. Forty percent of the building materials were regionally sourced, recycled or salvaged, and the architecture takes full advantage of natural light. As part of the University of Pennsylvania, the Horticulture Center is adding to an already robust portfolio of LEED buildings, which include the Perelman Center for Advanced Medicine, Franklin Field Pavilion Sports Complex, the Music Building and, most recently, the Law School building on Sansom Street. Founded in 1982 as a partnership of the University of Pennsylvania, the American Chemical Society and the American Institute of Chemical Engineers, the Chemical Heritage Foundation’s (CHF) mission is to foster an understanding of chemistry’s impact on society. But the $17 million green makeover at its Chestnut Street museum and conference center suggests that sustainability is also high on the CHF agenda. The CHF building renovations, unveiled in October 2008, include the recycling of all demolition materials (a significant undertaking, largely because the building’s layers date back to at least 1912), energy monitoring, motion sensitive lighting and a “recycled restroom” on the second floor, featuring double-flush toilets, plastic bottle walls and soda can floors. The organization includes sustainability in day-to-day work life, too, using exclusively recycled office paper and bathroom materials, and earth-friendly cleaning products. In 2002, energy control systems instituted at CHF reduced electricity usage by 65 percent. The largest green program at CHF is the Conference Center, which hosts 6,000 guests annually, but doesn’t use one-use paper products and plastic bottles. Instead, china, silverware and pitchers of water with glassware are used. In Spring 2013, the Philadelphia Zoo will introduce its biggest green building achievement to date: the Hamilton Family Children’s Zoo & Faris Family Education Center. Slated for LEED certification, the building will have green roof cisterns to recycle water, geothermal heating, energy efficient strategies and a stormwater management plan, among other features. The center will be joining an already impressive list of green building achievements at the Zoo—including geothermal wells at the McNeil Avian Center and Zoo Shop, and the Wetland at the Zoo, a manmade habitat around historic Bird Lake that received the 2012 Governor’s Award for Environmental Excellence. Along with green building, the Zoo has also worked to reduce its water consumption by half, and continues to implement sustainability-minded policies in energy use, waste management, horticultural care and purchasing. Curtis Institute of Music is one of the world’s leading conservatories. Founded in 1924, Curtis educates and trains musicians for careers as performing artists. Last fall, the Institute extended its Locust Street campus by opening the $65 million, LEED Gold certified Lenfest Hall. “It seemed as natural to utilize LEED concepts in the building design as it did to consider the sophisticated acoustical elements,” said Elizabeth Warshawer, executive vice president. The state-of-the-art music education and student residence building uses an energy recovery ventilation unit to recover heat and moisture from exhausted air. The building’s overall water use was reduced by 40 percent thanks to a green roof stormwater retention system and low-flow water fixtures and showers. Nine years after launching their Go Green! campaign at Lincoln Financial Field, the Philadelphia Eagles are reaching another sustainability milestone: local clean energy. Through a partnership with New Jersey energy company NRG, 14 micro wind turbines and 11,000 solar panels will provide 100 percent of the energy needed for game days. Solar panels will be installed along 11th Street, the stadium’s south-facing façade and in the parking lot. The wind turbines will sit on the top of the stadium’s north and south sides. Aimed for completion in December 2012, the changes will make Lincoln Financial Field one of the greenest major sports facilities in the world. These stadium renovations make sense for a team that’s been using environmentally friendly practices for nearly a decade. The Philadelphia Eagles headquarters and team facilities at the Novacare Complex are already outfitted with solar panels and green building elements. Composting and recycling are also key at Lincoln Financial Field, where there is a 97 percent diversion of game day waste—meaning only three percent of those hot dog wrappers, soda cups and leftover French fries go to a landfill. Even the cooking grease gets new life at a biodiesel conversion facility. 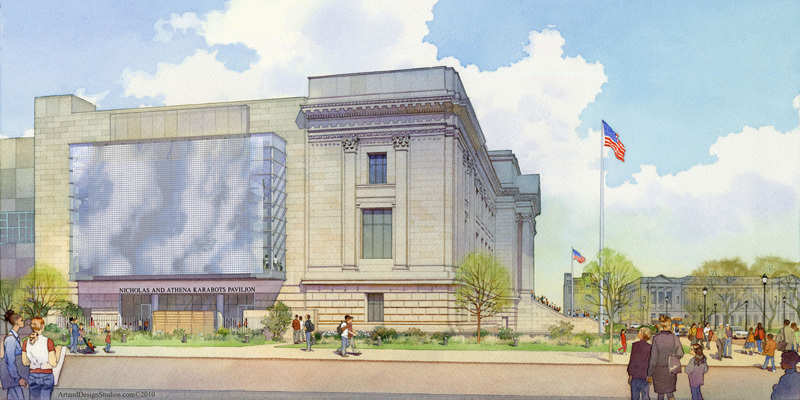 After more than two decades without major renovations, the Franklin Institute officially broke ground in April on a new facility: the 53,000-square-foot Nicholas and Athena Karabots Pavilion. Slated for LEED Silver certification, the building features sustainable elements including a rain garden, recycled and local materials, water efficient landscaping and Forest Stewardship Council certified wood. This state-of-the-art addition will house the permanent exhibit, “Your Brain,” as well as an expanded education center, modern conference center and climate-controlled traveling exhibition gallery. Construction is expected to be completed in 2013. While this is the first LEED building for The Franklin Institute, the museum is no stranger to sustainability. As a gold member of the Greater Philadelphia Green Business Program, the Institute has adopted green business practices internally to reduce the museum’s overall impact on the environment. This includes green printing practices, eliminating bottled water and offering a car pool message board for employees who drive. Education is an important part of the museum’s sustainability practices as well, and their website provides resources and book recommendations for the public on leading a more sustainable lifestyle.